This short video essay from CBS Sunday Morning gave me more food for thought. Naturally, I need that like I need another hole in my head, but I can’t pull the plug on thinking. This piece is ostensibly about the wide use of cell phones. Scratch the surface though, and it offers insight into the deepest essences of human nature, especially when you begin looking around for angles of profound sameness. First, check the video, Are we becoming disconnected by our love of devices? The video begins with the comment, “Once upon a time, in what seems a far-off land, if you saw someone walking down the street talking to himself, you’d think he was, well, crazy”. I’m not sure it is all that different really. One is talking to an imaginary person (someone not there) in both situations. Naturally talking to ourselves is a symptom of something deeper, and that’s probably a symptom of something still deeper, and so on. Anyway, let’s scratch the surface and see. I see two underlying features of this phenomenon: A profound need to connect, and the profound void that mind experiences, and for which we feel a profound need to fill. Connection for me was always problematic in my early years. Like so many, I felt a ‘soul mate’ promised an ultimate connection. All I needed was to find one. When I did, I hung on for dear life until she left me. That taught me not to put my needy ‘soul mate eggs’ in external baskets. Or to put it in Dao-speak: In desiring to let go, one must first begin. In desiring to take, one must first give. The only safe and secure ‘soul mate’ connection is an internal one. The external world ebbs and flows, always changing… Mainstream turns to strange, Good turns to evil. This helps explain people’s love for their god. He, she, or it, makes the most reliable of ‘soul mates’, depending upon the expectations you place upon your god, of course. Naturally, no one can truly advise another person how to establish that inner ‘soul mate’ connection. It is something each of us must stumble upon ourselves, usually after first stumbling across many dead ends. However, it may help to understand the emotional lay-of-the-land. I find the nearer I get to Right Comprehension, the more at ease I can be. Of course, Right Comprehension is not your normal worldly understanding. Normally, when you understand some thing you can draw upon it when needed. Right Comprehension is a contemporaneous knowing, which only protects me as long as I am touching it. Right Comprehension is really like maintaining balance: the moment you lose the awareness you topple over. Finally, this brings me back to that question, “Can we pull the plug?” I’d say, not until we connect with our internal ‘soul mate’. And even then, only when we have a living connection with ourselves. When that line goes dead, we are quickly impelled to plug into external resources. 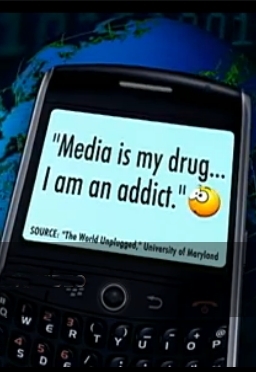 Ninety percent of American adults own cell phones and seems to be using them 90 percent of the time. “These days, the minute that people are alone, at a stop sign, at the checkout line in a supermarket, they panic, they reach for a phone,” said MIT psychologist Sherry Turkle. She says high-speed connections have left us more disconnected than ever. I kind of doubt that. The disconnection we experience is much more systemic; I suspect it is the consequence of a thinking mind. The need to control life is innate, as is the fear of being unable to control it. All this is just another way of expressing that fear. I feel the same about writing something down in pen rather than pencil, which I can erase of redo. Life is much more interesting when we ‘fly it by the seat of our pants’. To the extent the art of conversation allows for that, it will never be lost. Most conversation I hear is mundane, structured, predictable, safe… hardly an art. I’m not deriding ‘most conversation’; it is essential for social connection. I just wouldn’t call it art. “Is it too strong to call this an addiction?” asked Spencer. So where would we all be if suddenly we didn’t have any of these precious little devices? If we had to give up all smartphones, BlackBerries and iPads, what would happen? Could we even function? Researcher Sergey Golitsynskiy and his colleagues asked students around the world to go without their cell phones for 24 hours. “It ended up being the most horrible experience many of them had ever in their life, according to what they self-reported to us. Seventy percent of them quit the experiment, saying they simply couldn’t do it. “They felt a tremendous amount of boredom. They were bored without it,” said Golitsynskly. I’d watch the “Beverly Hillbillies” every week when I lived in Bangkok Thailand (early 60’s). It was a cultural connection, a touch of home. The power would often go out during the show and I’d freak out just like these kids going without their cell phones, in my view. This is about the pain of cutting off connection; the cell phone is no more relevant than any other external thing upon which I depend for connection. With maturity comes an increasing sense of internal connection. Perhaps that is a truer definition of maturity. Without looking out the window we can see Nature’s way. Accordingly, the wise person goes nowhere yet knows. Refrains from acting yet accomplishes. “The trend is toward ever more connection, ever more distraction,” said Carr. So would it be smart to throw away our smartphones? UCLA neuroscientist Gary Small thinks not. He’s used the latest imaging techniques to see what happens in the brain when people surf the web. He says “your brain on a book” and “your brain on Google” are very different brains. “Significant increases in brain activity, especially in the frontal lobe – the thinking brain”, he says. However, every advantage comes with a downside. Our clever minds prove the point… When intelligence increase, there is great falseness. I wonder when we will, as a species, come to realizing I don’t know is superior, not knowing this realization is a defect. Obviously, we probably never will as a species. Age lets many of us in on the secret, maybe all of us, truth be told. But then we die, replaced by youngsters who must retrace our step along this path, just as we’ve retraced those who came before us. Like the carbon cycle or the water cycle, this wisdom cycle is a wonder to behold.